It’s hump day! We’re halfway there, people. And I don’t know about you, but I am in need of a pick me up. What is it about three-day weekends that throw me so off kilter? You would think having the extra day off would be beneficial, but in reality, I think it throws me off for the whole week. Like, I have one less day to accomplish all that I want/need to in a week. Because let’s face it, I don’t exactly maximize productivity on holiday Mondays. It just feels like an extension of the weekend…which means: RELAXATION. Therefore, I spend the rest of the week making up for the “lost” time. Tuesdays always feel like Mondays…but times 10. This brings me to today’s recipe. Mochas! 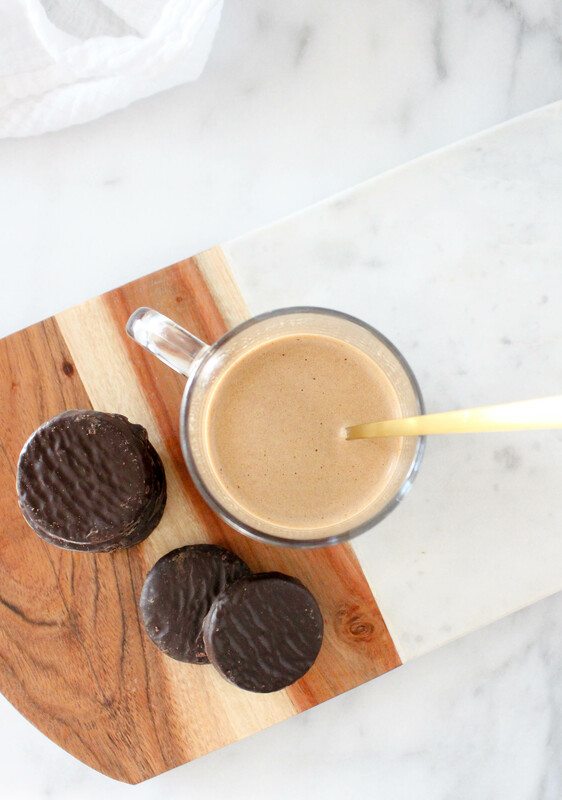 Peppermint patty mochas! Gosh, they make me giddy. Maybe that’s an effect of the caffeine? There is plenty to get excited over with these cute little espresso drinks. I love one of these in the mid afternoon, right after I’ve entered the post-lunch slump. I start off each day with a cup of coffee, and by the time 2 pm rolls around, I’m jonesin’ for some more. The extra kick espresso gives is perfect for getting me through the rest of the day. 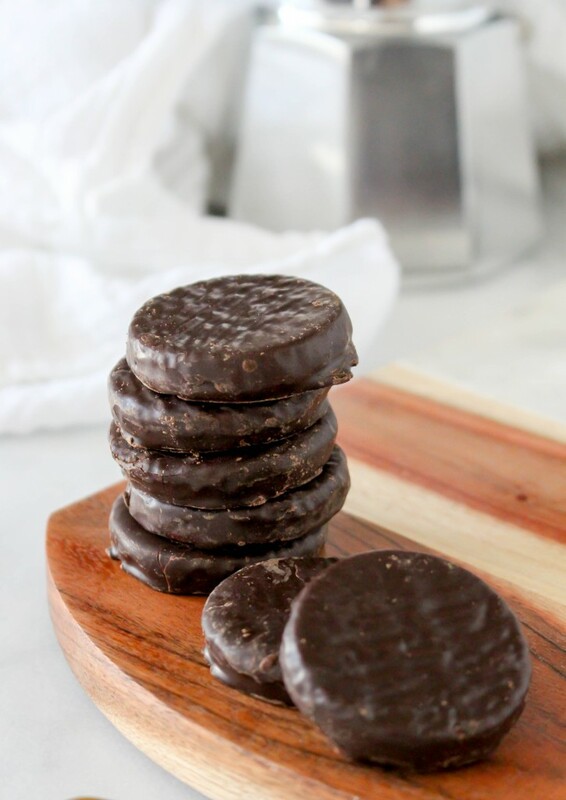 Peppermint patties are one of my go-to chocolate treats. I adore them. I always have. I remember walking to the corner store as a kid (yes, I actually walked to a store that was literally on a corner a few blocks down from my childhood home. Without adult supervision. This would never fly today. Sad.) and unloading my allowance for all the candy I could afford. My usual line up: Lemon Heads, sour straws or gummies, watermelon Bubblicious gum, Nerds, Milky Ways, Butterfingers, and York Peppermint Patties. Occasionally, a Reeses or box of Spree would make the cut, but York Peppermint Patties were a staple. I still remember skipping home with my brown paper bag brimming with treats. I’d run up to my room, dump out my goodies on my bed, and munch away on them one by one, savoring each and every bite. So, the peppermint patty is kind of a big deal in my world. It’s very nostalgic for me. It transports me right back to my childhood home, surrounded by Barbies and American Girl dolls and candy. Sound pretty great, right? It was. I think this is the reason I can rarely pass up the shiny silver York wrapper while standing in the checkout line at the grocery store. It just lures me in. Peppermint patties for life! 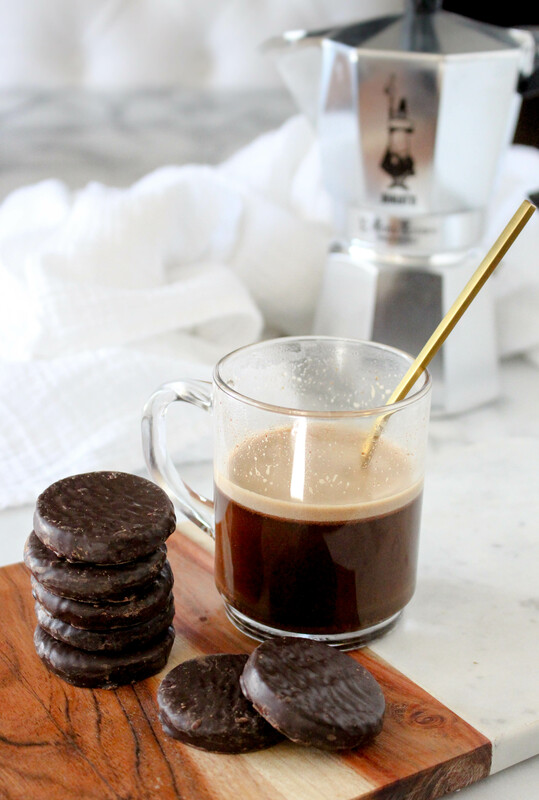 Now, when I thought about making my favorite childhood candy into a coffee drink, I was a bit hesitant. And here’s why: I am not a huge fan of mochas. I much prefer vanilla or chai flavors in a latte, or my Starbucks go to: a caramel macchiato. 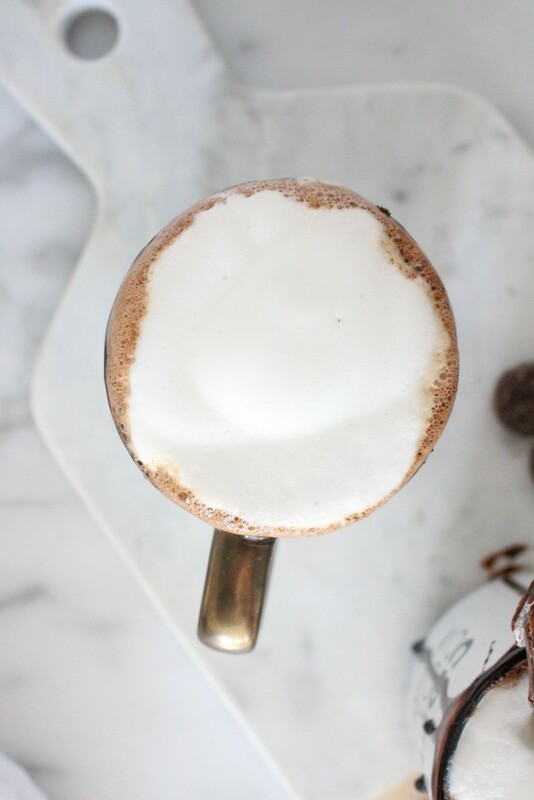 The chocolate aspect of mochas just always tastes…off. Maybe it’s because it’s not real chocolate? That’s probably it. Espresso at home has been made easy, thanks to my Nespresso . I’m obsessed with it. It makes perfect espresso every time. I also have a milk frother that makes making lattes/mochas/macchiatos a cinch at home. If you can justify the one-time splurge on one of these machines, do it! I was on the fence until my husband talked me into one, and boy, am I glad to have been wrong. Just that one time. It never happens otherwise. 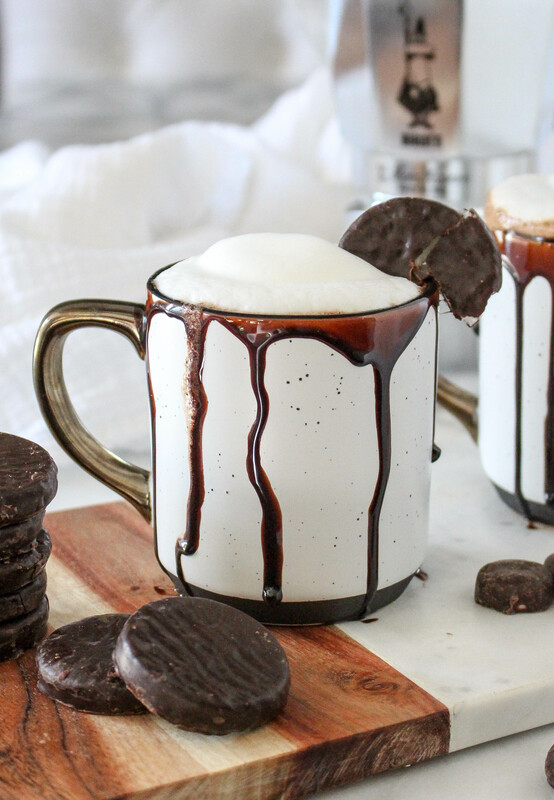 Place the chopped peppermint patty into the bottom of a large mug. 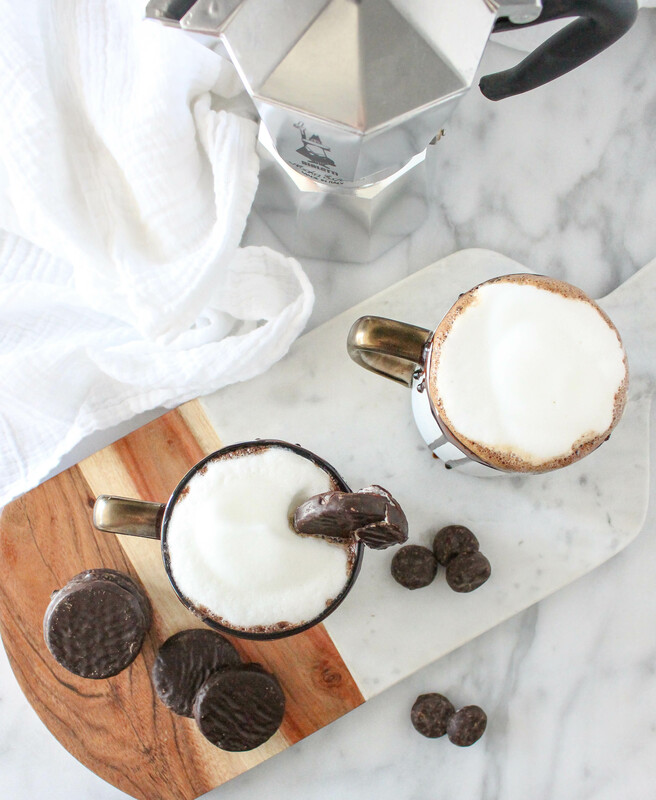 Pour the hot espresso into the mug and stir for a few seconds to melt the peppermint patty into the hot espresso. Top with the steamed milk and foam. 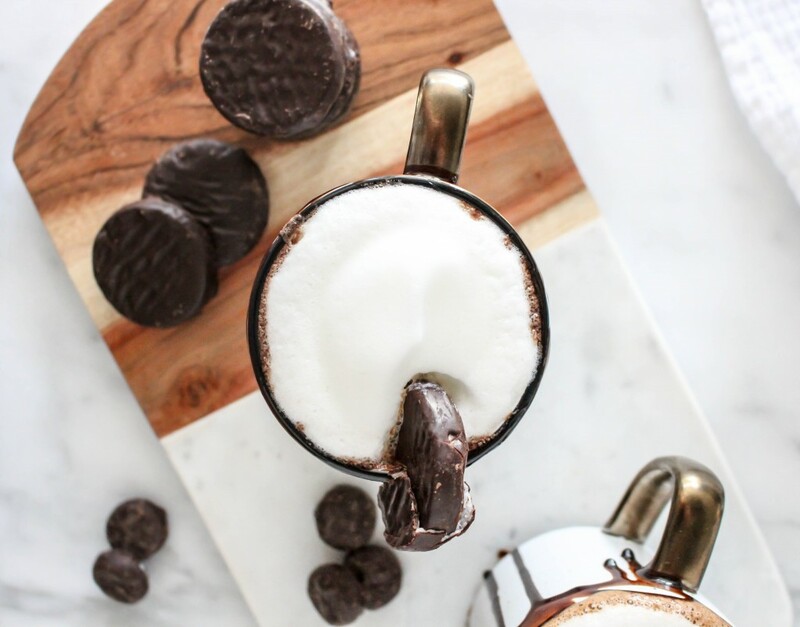 Garnish with chocolate syrup, whipped cream, and/or additional chopped peppermint patties. 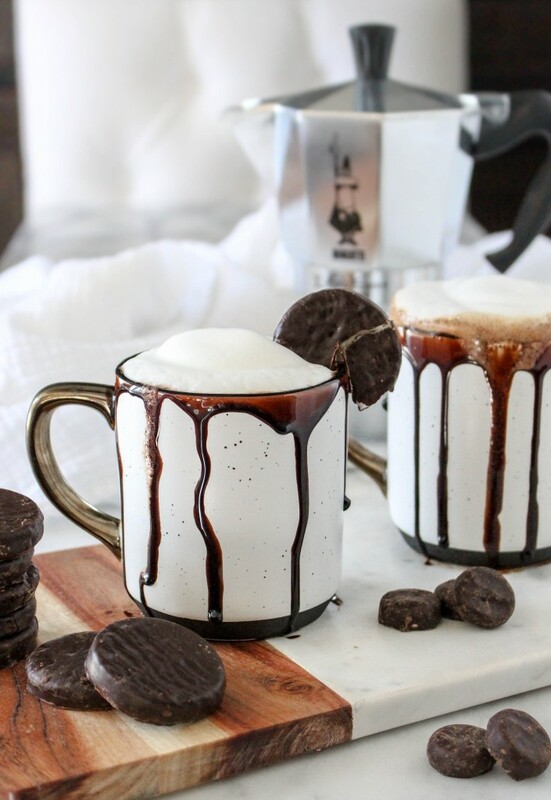 I find that using one peppermint patty is plenty sweet for my taste, but if a sweeter drink is desired, stir in a teaspoon or two of sugar or simple syrup (or up the amount of peppermint patty you put in the mug). All coffee beverages are definitely TO TASTE! I have a fancy-schmancy milk frother machine as well as a Nespresso with a built-in milk frothing option, so making steamed milk at home is a breeze. If you do NOT have either of these options (which I didn’t for many years), you can make your own steamed milk by heating it in a small saucepan over medium heat, whisking it almost constantly. As it gets hot, the whisking will create a sort of foam on top. Once hot and foamy, carefully pour the milk, while holding the accumulated surface foam back with your whisk/spoon, into the cup with your espresso and gently spoon the foam on top. Also: I have found that milk with lower fat content (skim or 1%) works best with this method. 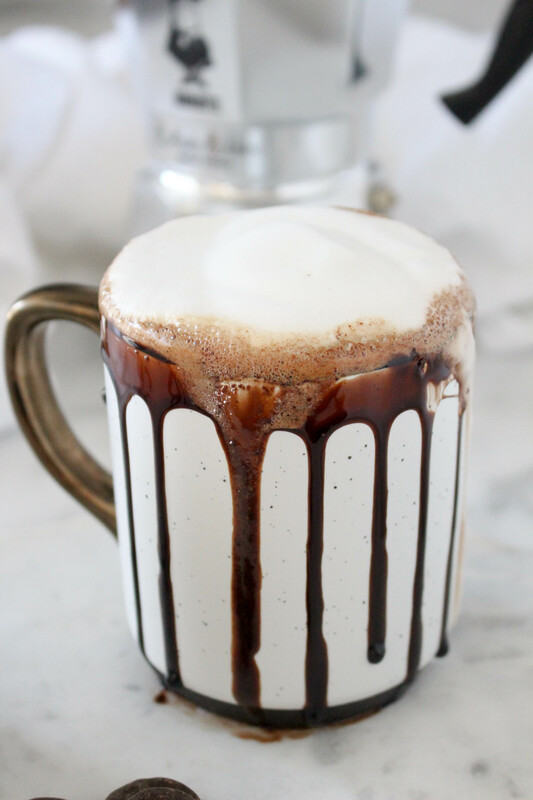 This mocha is gorgeous!! Love the simple addition of one peppermint patty. Definitely trying! These look amazing! I want a mug of one right now!